In my last blog post, I discussed the problems I have had with my knee, the recent injury causing meniscus tears and about the alternative treatment I elected to have instead of surgery. Well this week I underwent the treatments for the Regenexx SD procedure on my right knee and so far things are looking good. In fact, I just finished a very brief and very easy spin session on my bike (on the trainer, not outside). Although my knee does not have 100% range of motion, it is returning quickly. Day One, Pre-Injection - Injections to the knee to cause your body to think that the knee has been injured. This causes red blood cells to rush to that area so that the body can begin healing itself. Day Two, Blood Draw - Took blood from my arm to be spun down to get the platelets. Day Three, Bone Marrow Harvest - Draw bone marrow from my hips early in the morning to be spun down to extract my own stem cells. Return a few hours later to have platelets and stem cells injected into the knee, directly into the tears in the meniscus. Day Five, Post-Injection - Inject the knee with the platelets to encourage healing. This is like adding more fertilizer to the knee. These treatments were focused on my torn meniscus and, overall they went really fast throughout the week. I don't have a problem with needles, so it wasn't a big deal, though my knee did get sore throughout the week from having so many injections. The procedure to harvest the bone marrow was a bit strange because, once the doctor had me numbed up, he was putting his body weight on you to drive a needle into your hip bones to get to the bone marrow. They are actually going into the bones in the small of your back called the iliac crest. It's uncomfortable, but not painful. I definitely felt the injection of the stem cells because they put the needle right into the meniscal tears for the injection. Afterward it felt like my knee had been reinjured for day or so, that wasn't fun but it was much better than surgery. During the treatments that were performed, they were using a special x-ray to observer the proper insertion of the needles. This was pretty cool because I could watch what they were doing and see the needles going into my knee and hips. After all these injections, my knee was filled with a lot of fluid, so there was some swelling, I did not have full range of motion and I was limping because of this. But that seems to be returning pretty quickly as I can do stairs pretty easily now and my limp is nearly gone. Days Six and Seven - My knee felt like it had been reinjured and my back was a bit sore. For the first three days or so afterward, they tell you not to do much, just take it easy. After that, you can begin cycling and swimming for two weeks, but not full-on. They still tell you to take it easy. By the third week, you can walk as much as you like and by the sixth week you can begin integrating back into the activities you did previously, adding 20% per week. Additionally, I need to take collagen and hyaluronic acid supplements daily now to help maintain the cartilage in the joints. Somewhere between 6-12 weeks after this procedure, I will probably have my knee injected again to focus the ACL. There is a partial tear in the ACL, but not as bad as the meniscus which is what was causing most of the pain. This treatment is really new and not yet standard by any means. Although they have treated over 1100 people and had good success in most cases, it's still not a procedure that you can get anywhere in the United States. Right now, it's only offered in Broomfield, Colorado and a few other clinics in the US. In fact, the two doctors behind the Regenexx procedure are embroiled in a law suit with the FDA over one of their procedures. There's some really great discussion on the Regennex Blog and in a Forbes article titled Stem Cells and the Lawsuit That May Shape Our Medical Future. I am fascinated by the law suit because it seems to me that the FDA is favoring someone who offers an alternative treatment and basically playing politics instead of being objective on the whole thing. One common question that I've received is whether or not insurance covered the cost of the treatment and the answer is no. For me, this was an easy decision based on what happened with my previous surgery some 24 years ago. When I had surgery to reconstruct my ACL, literally the following week they began doing a different surgery through an arthoscope that was much less invasive and required far less recovery time. Because of this change right after I had my surgery, I was left feeling like I received the tail end of the surgical treatment technology at the time. I decided that I did not want to feel that way about having another procedure on my knee. My goal was to feel like I tried the newest proven techniques and treatment for my injury and I feel I have met that goal with the Regenexx procedure. The other item that figured into this for me was what I read about folks who had surgery for a torn meniscus and wound up worse off. Either they had part of the meniscus removed or enough shaved off that it affected the stability of the knee permanently. I didn't want to chance winding up worse off than I am now because I am so active. I can still have surgery if I ever need to, but I'm hoping that won't be necessary. There are certainly trade-offs here and everyone needs to make their own decision. Of course, at least part of the traditional surgery is covered by insurance, but not 100% of it. For me, the decision was rather easy to forgo the surgical option because I didn't want to chance having my knee wind up in a worse situation than where I started and I didn't want to take so much down time. Now only time will tell if this was a good decision. To read the follow-up to this blog entry, please read A Follow-Up on the Regenexx Stem Cell Procedure for my Knee. I have also written about having the Regenexx treatment for my left knee later in the year: The Regenexx Stem Cell Procedure For My Left Knee. Today I needed to set up a new MacBook Pro and as such one of the tasks was to install git on OS X Lion. Being that I am a fan of MacPorts, I decided to start there but I ran into some strange errors. Unfortunately I wound up doing a lot of yak shaving. The last time I installed MacPorts fresh, it was on a previous MacBook Pro that had OS X Snow Leopard installed. I successfully installed MacPorts and then used the port utility to install git without issue. Later I then updated to OS X Lion and had no issues with git or Xcode. Hunting around, I wound up finding a few things such as this MacPorts issue, only to discover that this issue was closed as invalid. So I hunted some more and found this question on Stack Overflow which had one hint but not everything to fix the situation. I also found some advice in a document about Migrating a MacPorts install to a new major OS version or CPU architecture. After stumbling upon and utilizing these steps, I completed my yak shaving session and finally got git installed successfully. This cost me a total of about two hours. Here's a great Ren and Stimpy video about yak shaving. Now I'm on to another weird problem with this new laptop, a couple of System Preferences are dimmed and I can't figure out why. Anybody know what may be causing this? On 1 February, 2012, I was scheduled to have knee surgery, but at the last minute I decided to cancel the surgery in favor of a more advanced treatment that requires no surgery. Here's a brief story to describe why I chose this route. All of my knee problems began when I was in high school. I was a pole vaulter on the track team and during an early spring season track meet while warming up I landed wrong and experienced a medial collateral ligament (MCL) tear as shown in the image to the right. Prior to this injury, I never had any knee problems so this injury was a very big surprise. There was no surgery required for the injury, just immobilization. So after eight weeks in a brace from my hip to my ankle that utilized progressive motion during the last four weeks, my doctor at the time took my crutches and told me good luck. I was just a kid and completely inexperienced with knee injuries to know any better. Little did I know that this lack of proper rehabilitation would affect me for the rest of my life. The following fall, I made the high school soccer team again and played soccer wearing a big knee brace. Because of the brace, people would come after me on the field to take me out and so I experience a number of sprains and strains throughout the season. But the very last game we played that year I twisted my knee badly and heard a loud pop. When my knee ballooned up in a matter of minutes to the point that I could barely bend it, I knew I had a bad injury. The result was an anterior cruciate ligament (ACL) tear. The image to the right shows an ACL tear, note that mine was a total tear and not a partial tear. Although I did extensive physical therapy, I wound up needing reconstructive surgery a few months later. At the time, this involved a large incision down the center of the knee so that a chunk of the patellar tendon to form a new ACL that was grafted to the femur and tibia by drilling new tunnels and using a chunk of the patella. At the time, it was pretty extensive surgery and damn painful. Essentially stealing from one area of the knee to fix another area of the knee. After nearly five months on crutches and one month with a cane, I was already into some rigorous physical therapy involving cycling, swimming and weight resistance/training. In that time, I also discovered that literally the week after I had surgery, the doctors began doing a new type of ACL reconstruction. This new type of surgery was/is known as anthroscopy and requires only very small incisions making it much less invasive than the style of surgery that I had and, as a result, required much less recovery and rehabilitative time. Through all the reading and research around knees that I have done since my first injury, I have also discovered that the immobility was the real downside to the old style of knee surgery. It left patients (including me) with a significant amount of atrophy or muscle deterioration. To this day, I have visible atrophy of the muscles in my right leg where all of my knee problems have occurred and it all comes back to the immobilization techniques used in my recovery. Over the last 24 years since the ACL reconstruction, I have experienced zero knee problems. But in December of 2011, while playing indoor soccer, I experienced a knee injury and I new right away that something tore. A month later, I found out that I experienced two meniscal tears (one medial, one lateral) as well as a possible partial tear of the ACL -- what?! Yes, the one that I had reconstructed so many years before. Through my own research, the lack of swelling and the type and location of pain, I had already guessed that I had torn my meniscus, so that was not a surprise. But I was very surprised by the news that there is a partial tear in the ACL. But the doctors did tell me that they couldn't tell for sure if this tear occurred at the same time. 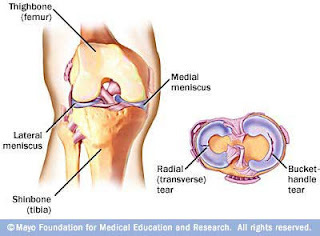 The image to the right shows the meniscus and my tears are located near the rear of each meniscus. So I decided to have surgery for the meniscal tears and during the surgery the doctor would determine if the ACL needed to be replaced. There were two options for the ACL reconstruction -- use part of my hamstring or use donated tissue from a cadaver. After researching both options, I decided I didn't want to steal from another part of my leg to mend my knee again, so opted for the donated tissue. My surgery would have been an anthroscopy which is good because it requires less recovery and physical therapy resulting in much less down time than I had when I was a teenager. As I researched and read about folks who had had meniscal tears fixed via the same surgery, I found many folks who had success with the surgery but I also found a surprising number of stories from people who said that their knees were worse off after such surgery. And they attributed these to a variety of issues including shaving the meniscus, stitching the meniscus and, in some cases, removal of part of the meniscus. For those who are not aware, the meniscus is a spongy, low blood flow tissue that pads the area in the knee where the femur meets the tibia. 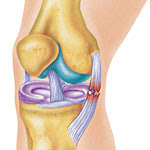 Injuries to this area can often cause arthritis over time and removal of any of the meniscus means less padding there. This is why you see folks who have had a bad experience with meniscal repair who walk so gingerly, especially up and down stairs. Given all of this, I didn't think that I had any alternatives, so I scheduled the surgery with the goal of being able to cycle this summer. 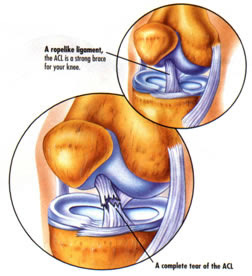 Only days before the surgery, my friend and neighbor informed me about an alternative to knee surgery called Regennex. Last year my neighbor had a persistent hamstring injury treated with a similar procedure known as Platelet Rich Plasma (PRP). PRP is a similar injection therapy for acute injuries that only uses the platelets from your own blood to promote healing. She experienced a full recovery to an injury that had been recurring for years. Needless to say, she is a fan. Regarding the Regennex treatment, she knows a woman who had the procedure last year and now is doing wonderful now. In fact, her case was even televised recently (see the video here: http://www.youtube.com/embed/DQ_H0yGLQh0?autoplay=0&). Being that the clinic where this procedure is being conducted is only a few miles from where I live, I decided to see if I could schedule an evaluation ASAP with the goal of avoiding surgery. A couple days later I was evaluated and found out that I was a candidate for this new procedure. Being that my first ACL reconstruction was essentially using the tail end of surgical techniques at the time, I didn't want to be in the same boat this time. I wanted to be on the cutting edge and to avoid surgery if possible. Also, knowing that I can have this new procedure more than once if necessary and that I can always opt for surgery at a later time if it truly becomes necessary, I decided not to have the surgery at this time in lieu of this new procedure. I am currently undergoing the Regennex Stem Cell Plasma procedure. This procedure involves a series of treatments where they draw blood from my arm to get the platelets out of it and they take bone marrow aspirate from my hip to get the stem cells out out it. Then they combine these two compounds and inject it into the damaged areas of my knee to encourage it to grow new tissue and essentially heal itself. My hope is to experience minimal down time (I will only need to avoid cycling for a few days) and continue being active. For more information about the procedure, check out Orthopedics 2.0 - How Regenerative Medicine will Create the Next Generation of Less Invasive Orthopedics. The one activity that I have begrudgingly decided to sit out on is soccer. I have always loved soccer and I still love soccer, but two of my three major knee injuries occurred playing soccer. As difficult as it will be to watch my wife and friends and kids still play soccer, I have decided it would be best not to play competitively anymore. I will continue to cycle, hike, run, swim and do nearly everything I love to do, just not competitive soccer. Stay tuned and I will let you know how things turn out as I complete the rest of the Regennex procedure.